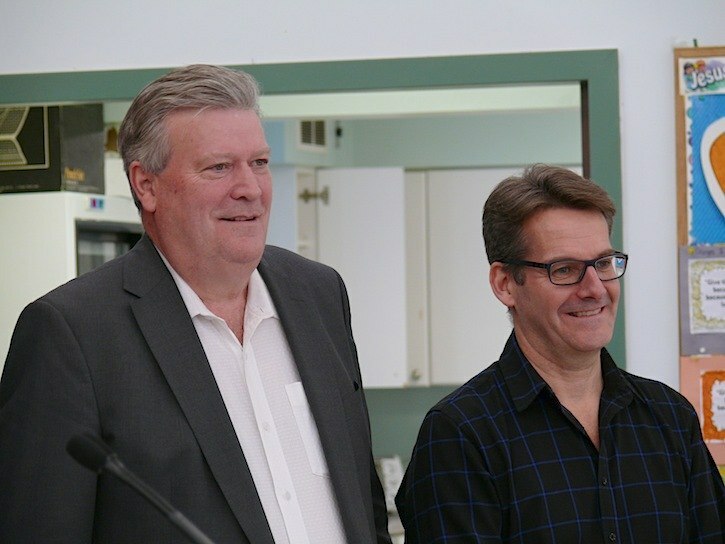 Housing minister Rich Coleman and Robert Brown, president of the non-profit Catalyst Community Developments Society spoke at the announcement of a new seniors housing project for Langley Township. Jan. 10, 2017 7:00 p.m. Ever since the Shepherd of the Valley Lutheran Church opened in 1984, there have been plans for some form of housing on the 72 Avenue site, just east of 200 Street. On Tuesday, those plans moved closer to reality with the announcement of $4 million in provincial funding for an 82-unit project to provide affordable rentals for seniors. The building will go up on vacant lot to the west of the church. The announcement was made by Fort Langley – Aldergrove MLA Rich Coleman, who is minister responsible for housing. Coleman said the Langley project is part of the September 2016 announcement of a $500-million investment in affordable rental housing by the B.C. government. Coleman said more announcements are coming across the province. “There will be 3,000 units by the end of March,” Coleman said. He said the province was approached a few months ago by the non-profit Catalyst Community Developments Society, “one of our best providers of housing” about financial help for the project at Shepherd of the Valley Lutheran Church.